Soon after the Divine declaration of His identity with Shirdi Sai, Sathya Sai, one day, miraculously produced some fruit which had never been tested or even seen by anybody in that area. His aunty (Father's sister) enquired about the fruit as to what it was and from where had it come? 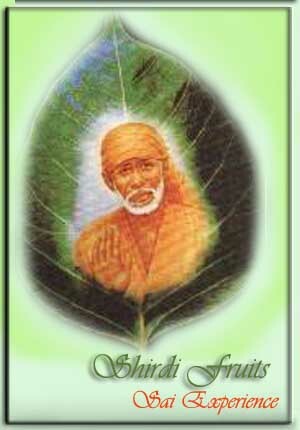 Baba smiled and replied, "I have called it from Shirdi". All present they received from the aunt a Shirdi fruit each. The basket could contain only about 40 such fruits, since Baba had touched it with His Divine hands, the fruits poured forth a plenty from the receptacle. Conceding the ardent request of the blessed aunt, Baba gave her also the Divine Darshan of His previous body. She describes it: "Baba took me to the inner room. At that time He had placed His palms on my closed eyes. Lifting His hands from my eyes, Baba pointed His finger towards the corner, directing me to see there. Aha' I saw Shirdi Sai right there sitting in His characteristic posture. His eyes were closed and there were clear signs of vibhuti on His forehead and arms, smoke arising from incense sticks, placed before Him. His body radiating wonderful effulgence, a Divine brilliance and splendour. This held me spellbound. A mild delicate and sweet fragrance percolated the atmosphere all round". In a few minutes Baba asked her, "Have you seen everything?" The fortunate lady replied, "Oh what a wonderful Divine Miracle!". An attribute, namely, remembering the details of a 'Poorva-janama (previous birth)', is possessed singularly by Divinity alone. For us common humans, even to remember broad high­lights and headlines of our lives, a few months or days prior, is often not possible. The sweet stream of Shirdi Life that issued forth from its Source (the Young Sai) could only be possible through the phenomenon of reincarnation. In His early teens, Baba composed and sang 'Nama-Sankirtana'- the sole remedy for the current Kali age-thus initiating the 'Namasmarna Movement', which comprises singing in congregation the glories of it God. During this period from His lips issued forth several enchanting Bhajans on Shirdi Sai, nay even earlier in the prankful days of early child­ hood the Bala Sai had sung similar melodies with His tiny-tot companions who repeated the same after Him with gusto. These melodies contained a flavor of precise details of Shirdi, Dwarkamayi, Booty-temple, Samadhi Mandir, Neem tree and bove all the 'Udi'. The local populace of course wondered as to who this Muslim Fakir was and what and where was Shirdi.